(T)here is much evidence of the direct responsibility of humans in the extinction of the ‘megafauna’ of Mediterranean islands. These island faunas included strange mammal assemblages with dwarf hippos and elephants the size of pigs. Archaeological sites in Cyprus indicate that human colonization began as early as 10,500 years ago and was soon followed by the rapid decimation of these mammals (Blondel 2006: 716). The loss of these animals had a direct consequence for the local environment: Forests and other vegetation could grow unchecked and previously open landscapes could be reclaimed over time. However, the rise of permanent settlements meant that such landscapes were not left to natural forces. The disturbance effect was compounded as humans managed these resources in the absence of large grazing animals, which of course leads us to the most “obvious consequence of human action”: deforestation. 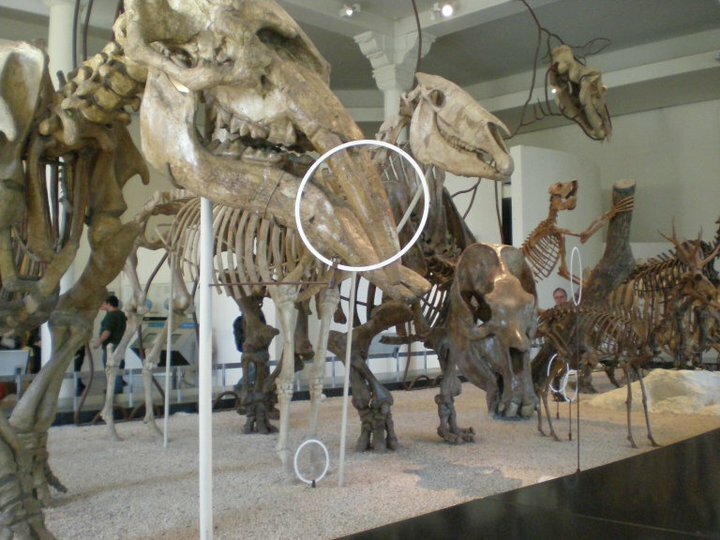 Fossils of large mammals on display at AMNH. Forest management through wood-cutting and coppicing, controlled burning, plant domestication, livestock husbandry, grazing and browsing, as well as water management and terracing have been for centuries the main tools for producing intermediate disturbance regimes (Blondel 2006: 716). For example, as already noted early humans may have contributed to the demise of large grazing mammals, however, the spaces these animals created by their behavior became important and necessary as humans became more settled and involved in their local environment. Fire cycles became an important means of maintaining open spaces and mosaic landscapes [pdf]. Cultivated plants in the Mediterranean Basic from the Neolithic onward included grain crops, fodder plants, oil-producing plants, fruit crops, vegetables, and a vast range of condiments, dyes, and tanning agents. The remarkable combination of protein-rich pulses and cereals that were domesticated in Neolithic farming villages of the Fertile Crescent, along with domesticated sheep, goats, cattle, and in some cases pigs, appears to have facilitated the rapid spread of herding and farming economies throughout the rest of the Old World. The perennial plant alfalfa, a source of fodder and green manure, apparently was also domesticated in the Middle East between 6,000 and 8,000 years ago and soon carried to all parts of the basin (Blondel 2006:717). The long-term accumulation of local differentiation during glacial times and subsequent human-induced selection processes together have resulted in the development of more than 145 varieties of domesticated bovids and 49 varieties of sheep. Over the centuries, hundreds of varieties of olives, almond, wheat, and grape, which have been selected intensively by humans, have also added to the biological diversity of the Mediterranean … human influence on population undoubtedly constituted a significant selective factor in their evolution through the process of domestication (Blondel 2006: 718). The Mediterranean Basin showing the range of olive trees. Gradual changes in land use practices, in humans’ use of chemicals or other factors, might have little effect until a threshold is reached beyond which restructuring occurs, restructuring that can be difficult to reverse (Blondel 2006: 727). Essentially, ecosystems tend toward stability cycling through positive and negative feedback from human activity. That stability is threatened permanently, resulting in badlands, once humans adopt industrial style agriculture and begin to use fertilizers and pesticides. As lush as the Mediterranean Basin? Manhattan as imagined in 1609 and present day. Computer Generated Image (top) by Markley Boyer, Photograph by Robert Clark. We are shaped by our environments as much as we shape them—and not all of it is bad. At a glance it may seem that New York City and its towering skyscrapers is cold and inhospitable. What room have we left for wildlife with our roads and our buildings and our harbors? We’ve even gone underground and edged out the earthworms with our subway system, our water pipes, and electric cables. National Geographic had a great feature last September exploring what New York City may have looked like in the 17th-century when Hudson sailed the Half Moon up the river. The island is depicted as a pristine, lush, verdant land—quite a contrast with today’s environment. But New York City is actually home to a fair number of flora and fauna, including eastern cottontail rabbits, white-tailed deer, ospreys, falcons, egrets, mockingbirds, bullfrogs, salamanders, terrapins, pufferfish, yellow perch, and a variety of crabs. And the website Urban Neighbors lists even more wild inhabitants that share our sidewalks and high-rises. New York State retains 62% of its forests, and has taken steps to preserve and manage that percentage. Still, there is no doubt that humans have done considerable damage to the New York City ecosystem. For example, human activity—overfishing and industrial growth—decimated the oyster population in and around the waters near New York City. But there is more to the natural flora and fauna here than meets the eye. While we may have the upper hand, humans, plants, and animals have forged an alliance of sorts. Peregrine falcons have claimed the tops of bridges, church steeples, and high-rise buildings. Beavers are returning to waters they once romped in. And the oysters are coming back, signaling that we’re inching our way back toward a stable marine ecosystem. Hindsight is not perfect. Things will always appear better after the fact, meaning it’s easy to say we should have done X, Y, and Z once we’ve actually already done those things. The important message to take from Rondel’s article is that our environment wants to work with us—and it’s foresight that will make all the difference. For more information, see The State of America's Forests [pdf] by the Society of American Foresters. My 8 year old niece asked me if extinction of animals is a good thing, does it mean that we are seeing a burst of evolution. We talked a bit about human impact on the world - may try to do a blog post to tease out her ideas and see how they correspond to current adult thoughts. GG, I'd definitely be interested in hearing about her thoughts. Glad to know she's already thinking about evolution!